While the longest government shutdown in U.S. history continues, President Trump's approval rating is down, and there are cracks showing with his base. A new NPR/PBS NewsHour/Marist poll finds Trump's approval rating down and his disapproval rating up from a month ago. He currently stands at 39 percent approve, 53 disapprove — a 7-point net change from December when his rating was 42 percent approve, 49 percent disapprove. Down marginally among white men without a college degree, from 56-to-34 percent approve to 50-to-35 percent approve, a net change downward of 7 points. "For the first time, we saw a fairly consistent pattern of having his base showing evidence of a cracking," said Lee Miringoff, director of the Marist Institute for Public Opinion, which conducted the poll. "Don't know if that's temporary — tied to the government shutdown — or a broader problem the president is having." The percentage of people now saying they strongly disapprove of the job the president's doing is up to 45 percent, the highest for President Trump since December 2017. The president also faces some significant headwinds for re-election in 2020. 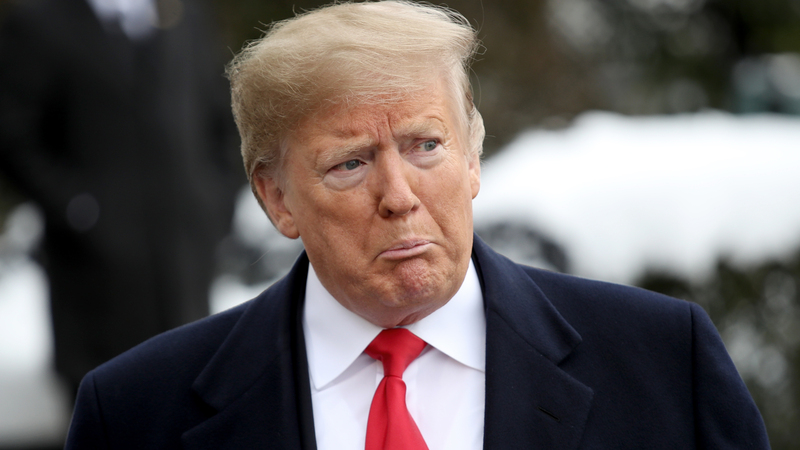 Just 30 percent of registered voters said they will definitely vote for Trump in 2020, while 57 percent said they will definitely vote against him. Just 76 percent of Trump supporters, 69 percent of Republicans and 58 percent of white evangelicals say they will definitely vote for him. Many, if not most, of them will likely vote for the president, but their softness in supporting him for re-election is a sign of vulnerability. For context, in 2010, when asked about then-President Barack Obama, just 36 percent said they would definitely vote for him, while 48 percent said they would not. Obama went on to win with 51 percent of the vote. But for Trump to have more than half the country already saying it definitely won't vote for him indicates he is facing a difficult re-election. "The president has had his base and not much else," Miringoff said, "and when you look ahead to the election ... he enters with a significant disadvantage. His re-election prospects would definitely be in jeopardy at this point." Trump has a lot of work to do to be able to reassemble the coalition that voted for him narrowly to win in the Electoral College in 2016. He lost the popular vote by almost 3 million votes and won just 46 percent of the vote. He won by about 70,000 votes combined between Pennsylvania, Wisconsin and Michigan, all states that have trended away from the president during his first two years in office. As for who Trump would face, former Vice President Joe Biden stands apart from the Democratic field, in terms of how Democratic voters feel about him compared to others. Biden is the best-known potential Democratic candidate, and is very well liked — 76 percent of Democrats and Democratic-leaning independents have a favorable impression of him. Just 12 percent have a negative view. "If he gets in, he automatically becomes the front runner with numbers like this," Miringoff said. "He becomes the candidate who you have to get into the mix with and be competitive with him." Barbara Carvalho, director of the poll, added, "It is unusual to see a candidate, who's been part of the Washington scene for so long, have such a low unfavorable rating." Bernie Sanders, the principal challenger to 2016 nominee Hillary Clinton, is well-known, but between 1-in-3 and 1-in-4 Democrats have a negative opinion of him. There are a lot of questions about whether Sanders will be able to keep his base of activist supporters together, four years later, now that Democrats have so many more options. Massachusetts Sen. Elizabeth Warren has an almost equally high favorability rating as Sanders, but is not viewed as negatively. Others are potentially well-positioned, too. New Jersey Sen. Cory Booker, Texas Rep. Beto O'Rourke and California Sen. Kamala Harris are in a next tier and have a capability of taking off if they make a good impression as voters get to know them. The poll isn't good news for all potential Democratic contenders, however. The Democratic primary electorate does not appear ready for a billionaire. As former New York Mayor Michael Bloomberg weighs a run, Democrats are evenly split on their views of him, while about half of them haven't yet formed an opinion. A primary challenge to Trump? There has been talk of a primary challenge to President Trump, but no candidate emerges with particular backing. Ohio Gov. John Kasich and Mitt Romney are viewed more unfavorably than favorably with Republicans and Republican-leaning independents — 24 percent view Kasich favorably, 28 percent view him unfavorably; 29 percent view Romney positively, while 48 percent view Romney negatively. Romney has been an outspoken critic of Trump, and the GOP base does not appear to appreciate that. "There is no strong support" for a primary challenge to Trump, Miringoff said. "Kasich is not well-known, and Romney is not particularly popular." As this shutdown continues, 59 percent said they mostly blame President Trump or congressional Republicans for it. And more than 6-in-10 are in the mood for compromise — 63 percent said they want their elected officials to compromise with people they disagree with rather than stick to their positions, including a majority of Republicans. Just 31 percent overall said they want their elected officials to stick to their positions no matter what. Strong Republicans (50 percent), African-Americans (51 percent), Trump supporters (53 percent), Latinos (55 percent) and Gen Xers (56 percent) are among the least likely to say they want their elected officials to compromise. "People are looking for compromise right now," Miringoff said. But neither side is seen as doing a very good job of it right now – 57 percent think the Trump administration is doing too little to work with Democrats in Congress; 55 percent think that Democrats are doing too little to work with the administration. Neither party is making a very good impression, either. Only about a third of Americans have a positive view of congressional Democrats (34 percent) while a majority (53 percent) disapprove of the job they are doing. An even lower number (29 percent) have a positive view of congressional Republicans and more view them negative (58 percent). The survey of 1,023 adults was conducted from Jan. 10 to Jan. 13 by The Marist Poll for NPR and the PBS NewsHour. Results for all Americans have a margin of error of +/- 3.8 percentage points. There were 324 Republicans or Republican-leaning independents surveyed. Where they are referenced, there is a margin of error of +/- 6.8 percentage points. There were 417 Democrats and Democratic-leaning independents surveyed. Where they are referenced, there is a margin of error of +/- 6 percentage points.